It was the summer of my 7th grade year, and here I was at thirteen years old about to teach my first 5-Day Club (like a backyard Bible club), with a guy I didn't know, to a bunch of wide-eyed kids who were expecting to be entertained for the next hour. I can still remember getting through my part of the club only to be told at the end that I had made what was supposed to be the longest story of the week into a 4 minute summary. Go me. Yet that week confirmed in my mind that I loved teaching, and a big part of it had to do with the amazing hostess and kids! Charity was one of those amazing kids, and I was honored 13 years later to be able to attend her wedding! While it actually took place one rainy day this last summer, the colors she used would also make for a beautiful winter wedding! So enjoy these creative ideas thanks to her! 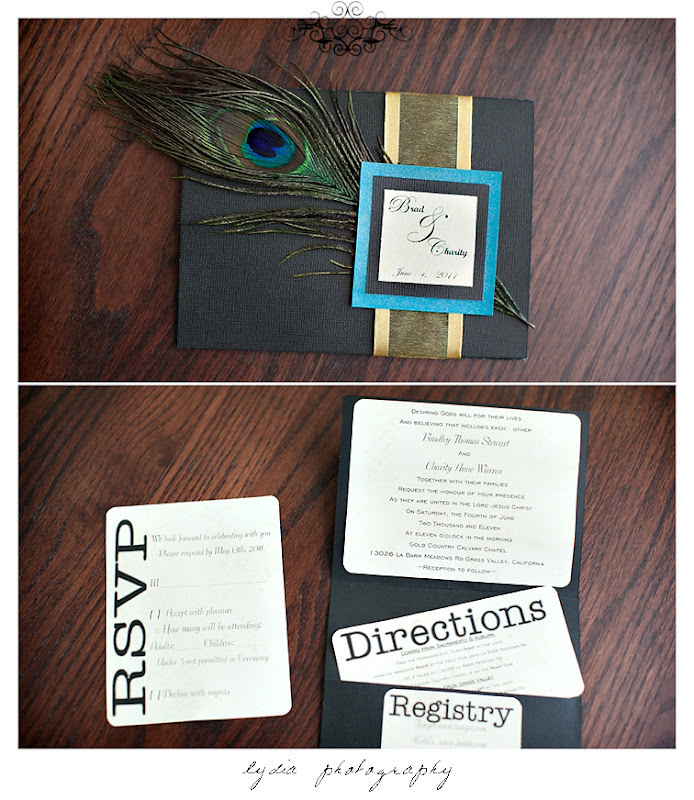 With the peacock feather as inspiration, Charity chose teal and black as her main colors and did a great job showcasing that with her invitations! 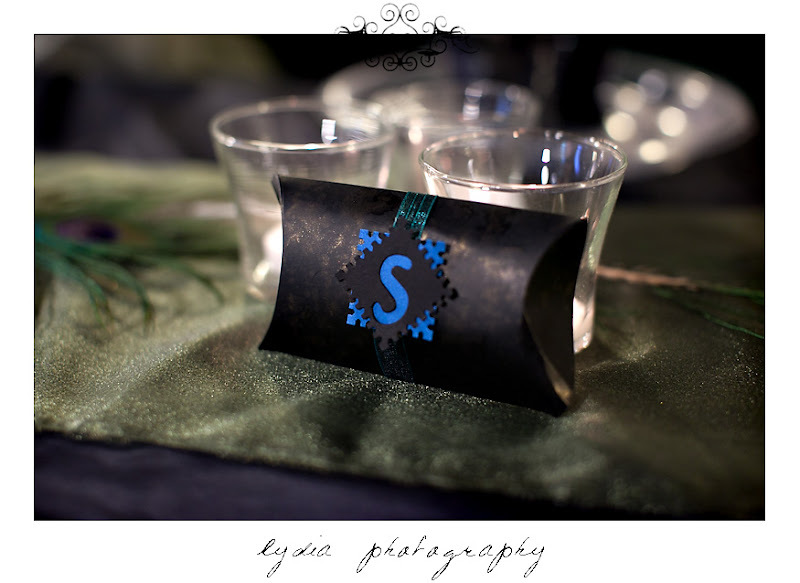 Mini candy envelopes personalized with their last initial decorated each place setting and gave guests a great way to take home a sweet treat! 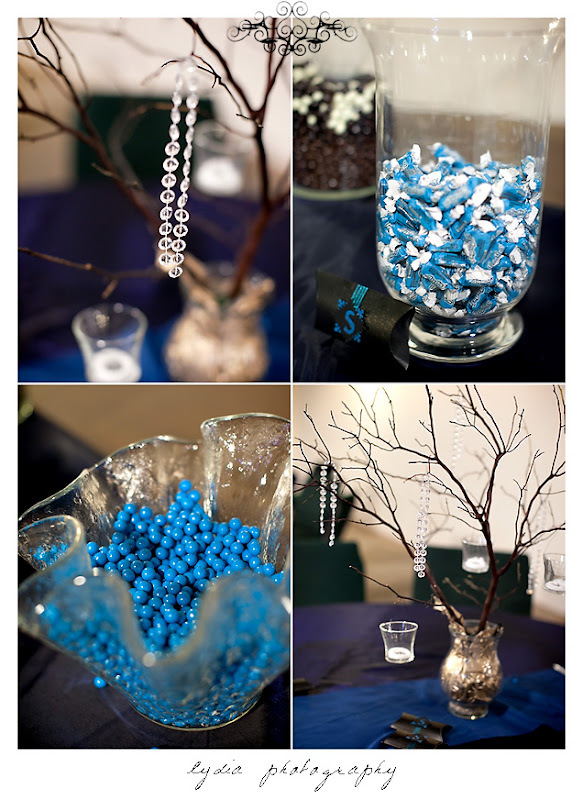 The candy buffet was a hit with the peacock colored candy, keeping with the theme, and each table centerpiece was created with manzanita branches they cut themselves and covered with hanging crystals and tea lights!